Being a carpet cleaning business, we constantly hear bad advice and incorrect info about carpet cleaning. 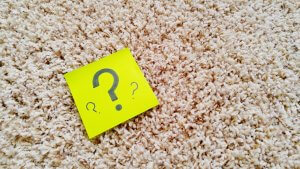 We took the top 10 myths that you might still believe about carpet cleaning and debunk them. 10. Cleaning my carpets will cause them to get dirty faster! IF you get your carpets cleaned improperly, this can be true. Since some methods leave behind sticky residue and soil, it is correct that improper cleaning can make your carpeting soil quickly. However, if you hire a pro company like Rendall’s, your carpets will not get dirty faster. In fact, your carpet stays cleaner longer because we do a thorough job of rinsing out all of the soil and cleaning agents, leaving your carpet virtually residue-free with our cleaning methods. 9. Steam cleaning will cause mold or mildew to grow in my carpet! Again this could be true IF you get your carpets improperly cleaned, but the proper way of cleaning will NOT cause mold or mildew to happen. We hear from a lot of clients about different companies who have left their carpets soaked for several days. This is not normal, and we never leave your carpets soaking wet. If your carpet is wet for several days, there is a chance that bacteria wants to grow in that environment. Properly cleaned carpets will not create mold or mildew. 8. Vacuuming too much will damage my carpet! Modern installed carpeting is designed to hold up to lots and lots of vacuuming. That said, there are some vacuums on the market that may be too aggressive for everyday use. We are not at liberty to name names because we didn’t perform the tests. A large carpet manufacturer once reported that their tests revealed that one particular popular consumer vacuum caused 2 years’ worth of wear with one use! But that’s certainly not the norm and most vacuums are perfectly safe for frequent use on modern carpeting. The Carpet and Rug Institute has a list of tested and approved vacuums on their website: CRI Green Label Vacuums (clickable link). Our current favorite (as of 11/1/2016) is the Shark Rotator Professional vacuum. Bottom line – the majority of soil found in virtually every carpet is dry soil. Hoover vacuum’s testing revealed that about 80% of all soil carpeting is of the dry variety and much of it can be vacuumed out. Vacuuming once a week is usually sufficient for most homes, but high traffic areas and businesses may require up to daily vacuuming. 7. Baking soda or other powder deodorizers will remove the smell from my carpet! We hear and see this one often. Unfortunately, it’s one of those old tales that get passed down to each generation. I know there is at least one of you reading this saying “this worked for me, this is a lie Jackie, a lie!” I hate to be the bearer of bad news, but this method only masks odors and doesn’t remove the source. Baking soda can absorb some of the odors, but it does not remove the source of the odor. These powder deodorizers also cause havoc for us when we try to clean because it is impossible to vacuum it all out. The leftover powder eventually causes friction and wear, causing permanent damage to your carpet. Not to mention the smell probably will ultimately return. The best way to deal with odors is to remove the source of the odors. Let’s take pet urine, for example. When urine contacts the carpet, it soaks through the fibers and down into the pad. If the pet continues to eliminate in that same area, the urine may even penetrate through the carpet pad and into the subfloor. Each layer that’s contaminated must be neutralized in order for the odor to be removed. That means the carpet, the backing of the carpet, the carpet pad, and perhaps even the subfloor will require decontamination in order for those pesky odors to be fully removed. Suffice it to say sprinkling baking soda or powder deodorizers on the carpet only absorb moisture in the fibers, and do nothing for neutralization of the urine contaminants, nor the other layers of contamination under the fibers. The rule we use works every time: Remove the odor source to remove the odor – and we do this by flushing out the contamination rather than trying to mask it. 5. My carpet isn’t that old, it doesn’t need to be cleaned! When people refer to their carpet as ‘new’, most of the time it’s already a few years old. Carpet is designed to hide soils, so even if it looks “clean”, more than often it’s not. In fact, by the time the dirt is visible, most of the damage has already occurred. Generally speaking, you should get your carpeting cleaned between 6 and 12 months. You should go no longer than 18 months without a professional cleaning. 4. I can use any grocery store cleaner to remove a stain! This myth can be disastrous to your carpet! Many of the big brand name carpet spotters attract soil and can even ruin your carpet. We have seen it all too many times. From our experience, if a client uses one of these “bad” carpet spotters it is extremely difficult to try and correct the problem. What’s the solution? Well, we know of a fantastic product that will remove hundreds of different spots and stains called… Stain Fu! We might be a bit biased because it is our product, but this is exactly why we created this carpet spotter in the first place. It is a carpet spot cleaning product that we can guarantee to be safe and effective. The carpet cleaner’s favorite myth! This is one of those times where the saying “if it’s too good to be true…” comes into play. We don’t like ‘bashing’ other companies, but we do want people to know the truth about these types of ads. With that said. the types of cleaners that charge this way are commonly referred to as “bait and switch” artists. These companies typically advertise a very low price and once they get their foot in the door they add dubious charges on to the bill that they claim are necessary to do an acceptable job. Fox News did an expose awhile back about these types of cleaning companies. What they found is that the typical bill came out to upwards of six times or more the advertised cost! A secondary problem with these types of cleaners is that they don’t use state of the art equipment and supplies, and don’t have trained professional technicians like we do. Additionally, since many of their customers don’t agree to their exorbitant charges, they can’t afford to do a good job. 2. Steam cleaning will shrink my carpet and upholstery! Most installed carpet is made of synthetic materials that will not shrink. However, we test everything before we clean to ensure that there will be no problems. If we find a carpet or piece of upholstery that may have problems with “steam cleaning”, we can employ one of the other 4 cleaning methods to ensure as good a job as possible. Keep in mind, however, that approximately 87% of all carpeting and 75% of all upholstery is perfectly safe to “steam clean” so long as the technician knows exactly what they are doing. 1. Dry cleaning is a better method than “steam cleaning”! I’ve noticed there is a trend here about improperly cleaned carpets, as this myth was probably derived from bad carpet cleaning. Each method has its pros and cons and is a hot debate among other cleaners. The pros of dry cleaning is that yes, your carpets are technically drier versus using hot water extraction. Con is that it is more of a surface cleaning, not really a deep cleaning because there is no extraction. Because of this, it has the tendency to leave residue in the carpeting, causing it to re-soil faster. However, on certain types of carpeting, “dry cleaning” can be a better method. Especially if you correctly clean and use the right products. So for this, we can’t really say one is better than the other; It is a matter of choosing the right cleaning method for each client and their situation. Did you believe any of these Top 10 myths before this post? Let us know! I wish more could be done to get rid of bait and switch cleaners. Not only is it bad for the consumer, but it makes it hard for reputable carpet cleaners to justify their prices. It’s interesting that vacuuming won’t actually damage your carpet. It makes sense that modern carpets are designed to withstand it. I’ll have to remember this because I didn’t want to get my carpets cleaned for this reason but now that I now that I know it’s not true, my carpets have gotten gross. I never understood the theory that cleaning your carpets makes them dirtier but I’m glad you cleared it up for everyone else. Thanks so much for sharing! This article gives the light where we can observe the reality. Appreciate it for writing this Article. I feel as though I know so much more about this than I did before. Your Article brought some things to light that I would never have thought about before reading it. I am so glad that you mentioned that steam cleaning if done properly, won’t cause mold or mildew to grow in your carpet. A friend of mine told me the opposite a few years ago so I have always been wary of the whole process. It seems like hiring a professional to do the job would be the safest option so that you don’t damage your carpet in any way and so that it gets the best cleaning possible. We will have to keep these tips in mind, thank you for sharing! I will definitely have to find a local cleaning service so the fabric can look good and clean again. Thanks for your helpful information! Thank you for clearing up that allergies are from a range of things such as walls, floors, and air instead of just carpet. Recently I’ve noticed that my carpet has become very dirty from all the water and snow tracked through my home. I think it is time to research carpet cleaners in my area. I want to get my carpets cleaned as soon as possible. It’s helpful to know these truths about carpet cleaning. I like how you said that steam cleaning won’t actually affect it in a negative way. We want to get our carpet cleaned, so we’ll make sure the professionals we hire don’t leave it soaked through. I tried to clean my carpets with one of those rental machines from the grocery store. It seemed to be dirtier sooner. I will always go with calling a professional from now on. That’s good to know that you shouldn’t go longer than 18 months to have your carpets professionally cleaned. The carpet in my living room is starting to look dingy since my two sons and our German Shepherd will play in there, so I’m looking up what to do to keep it looking nice. I’ll have to find a carpet cleaning service I can hire to clean my carpet to get it clean and them make sure to have them come at least once a year so I can maintain it.